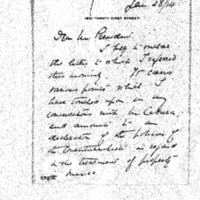 William Phillips forwards a letter to Woodrow Wilson from Luis Cabrera regarding the Mexican government. I beg to enclose the letter to which I referred this morning. It covers various points which I have touched upon in my conversations with Mr. Cabrera, and amounts to a declaration of the policies of the Constitutionalists in regard to the treatment of property in Mexico. I am still awaiting the telegram from General Carranza dealing with the Mexico — Vera Cruz situation. Phillips, William, 1878-1968, “William Phillips to Woodrow Wilson,” 1914 January 8, WWP18316, First Year Wilson Papers, Woodrow Wilson Presidential Library & Museum, Staunton, Virginia.